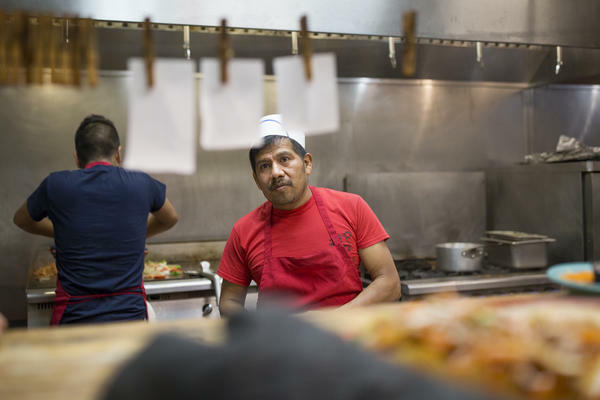 Armando Hernandez prepares lunch orders at El Torito restaurant in Galax, Va. El Torito is one of several Mexican restaurants in town and the servers say that their clientele is predominantly white local residents. Officer Eduardo Mata, left, stands with his mother Leticia Mata, right, on the porch of the trailer they share in Galax, Va. Mata graduated from the police academy on June 28. He is one of only two Spanish-speaking officers. Mata grew up in the Hispanic community in Galax and says that many residents were afraid of encounters with police. Galax, Va. is dotted with small stores and references to the town's history as the center of "old-time" fiddle music can be seen everywhere. Michael Stevens, senior executive vice president of Vaughan Furniture Company, sits at his desk in Galax, Va. Following the decline of the furniture production industry in Galax, the Vaughan Furniture Company was forced to largely shut down. 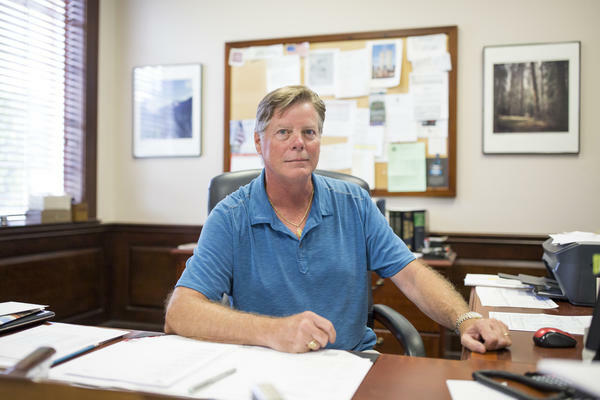 Now Stevens oversees the leasing of their facilities and office spaces to other companies as they try to sell their large properties in town. 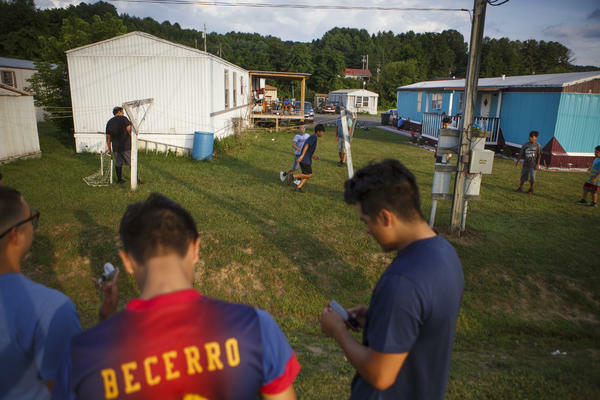 Children play soccer in the predominantly Hispanic trailer park off Hanes Road in Galax, Va. With a population of just around 7,000, the small town of Galax in rural southwest Virginia has one of the fastest-growing Hispanic populations in the state. Young adults who were born in Galax or arrived as children are now starting families of their own. A dishwasher's hat sits on the sink at El Torito restaurant in Galax, Va.
Ricardo Osuna, right, who graduated from high school this spring, and head soccer coach Troy Barkley, left, leave the Galax High School field. Osuna helped to lead the school's soccer team to the state championship title the past two years. Barkley credits the sheer love of soccer that his Hispanic players have as a contributing factor to the team's success. Ricardo Osuna, who graduated from Galax High School this spring, holds a Virgin Mary necklace that he wears. Osuna helped to lead the school's soccer team to the state championship title the past two years. 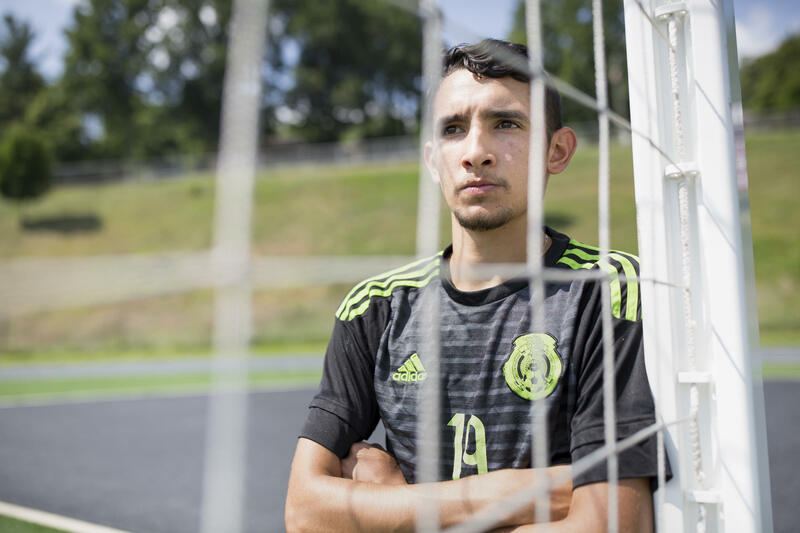 Ricardo Osuna, who graduated from Galax High School this spring, stands in the goal at the high school field. 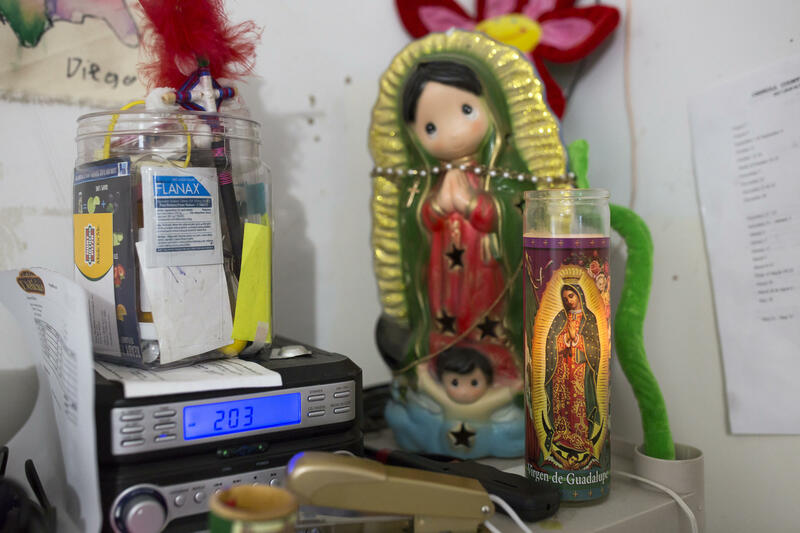 A small shrine to the Virgin of Guadalupe sits behind the counter at the tienda that Fabiola Escamilla owns in Galax, Va. Escamilla is a DACA recipient. Despite living in Galax for much of her life and raising her two sons there, she is still very concerned about her immigration status. Gaspar Rodriguez sits with the family dog Cachito outside the tienda that his daughter Fabiola Escamilla owns in Galax, Va.
Piñatas hang in the window at the store that Fabiola Escamilla owns in Galax, Va.
To explore some of the poll's findings, we went to the small town of Galax, in rural southwestern Virginia, which has one of the fastest-growing Hispanic populations in the state. There, we found a community that holds many of the complicated — often conflicting — views on immigration that the nation does. 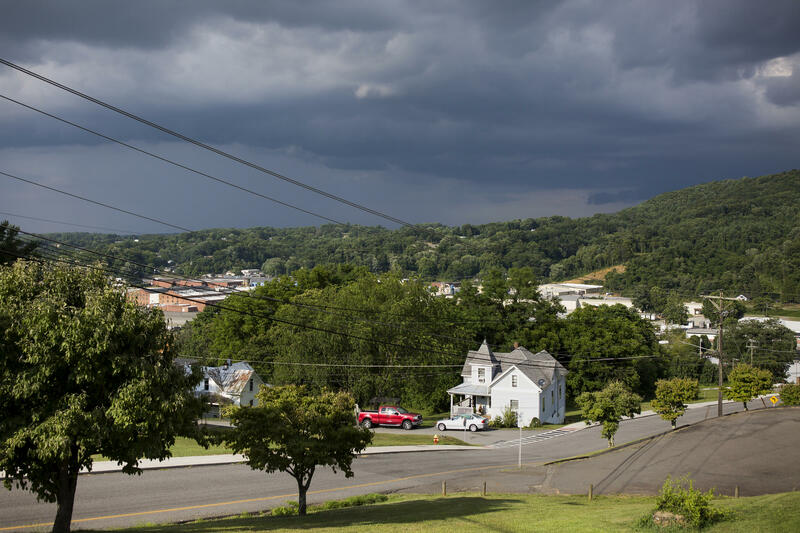 About 7,000 people live in Galax, set in the gorgeous Blue Ridge Mountains, close by the North Carolina border. "When I was growing up, Galax was very white; a very traditional small-town mountain community," says Elizabeth Stringer, 40, who teaches English as a Second Language at the high school. Over the past 18 years, she's seen her student caseload balloon. In the Galax schools now, almost a third of the students are Hispanic. Most of Stringer's students came from Mexico, but recently, she's been teaching more kids who fled from Honduras. "Some of them through the desert," she says, "some of them crawling through sewer pipes and being lost just to get here. "I feel like anyone who can turn someone away who has done that to have a chance to live is just wrong." When Stringer hears President Trump compare undocumented immigrants to an "invasion" or "infestation" of the U.S., she bristles. "I think of cockroaches," she says. "I think of horrible nasty things to be eradicated and that's not what these people are. They're really good people." Another benchmark of Galax's demographic change: of the 11 starters on the high school boys' soccer team this past year, all but one were Hispanic. Striker Ricardo Osuna, 17, who just graduated from Galax High and whose father is Mexican, says the Galax community is open and welcoming. But the opposing teams? Not so much. "When we played, there was a bunch of racism," he says. "Like, 'Oh, wetbacks, get outta here!' Once I got a yellow card, and they were like, 'Hey ref, give him a green one, he probably needs it!' Everybody was really mad about it." 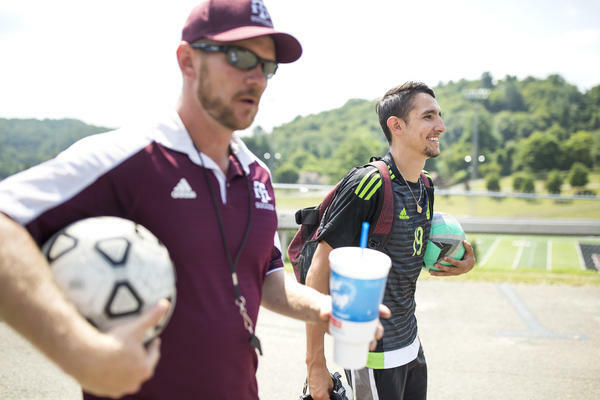 The Latino soccer players have powered the Galax team to four state championships in the last five years. The champion team is celebrated with a triumphant victory parade through town, escorted by fire trucks and police cars. "You can tell they've played for so long, since they were two or three years old," says head soccer coach Troy Barkley, 37. "It's a way of life for some of these kids." Barkley takes a liberal view of immigration, whether people have entered illegally or not. "I feel like we're a nation of immigrants," he says. "There's a reason they want to come here. Whether they're coming for a better life, or they're coming to escape something in their home country. "I don't know how all of a sudden you can shut that off. I mean, that's kinda what the American dream's all about. So I think it's a good thing. Puts a lot of diversity in the community, makes it a real neat place to live." That doesn't mesh with the views of many of Barkley's Southwest Virginia neighbors. This part of Appalachia is solidly red. Nearly 80 percent of people in the surrounding counties voted for Trump, so the president's tough rhetoric on immigration and his zero-tolerance policies at the border have strong appeal here. Nationwide, our NPR-Ipsos survey shows a sharp partisan split. For example, 52 percent of Republicans support separating families who cross the border illegally, as a deterrent. Just 11 percent of Democrats and 25 percent of independents support family separation. Galax is famous for its musical heritage of old-time and bluegrass music; it hosts what it bills as the world's oldest and largest fiddlers' convention each August. The town used to be known for its once-thriving furniture and textile industry. 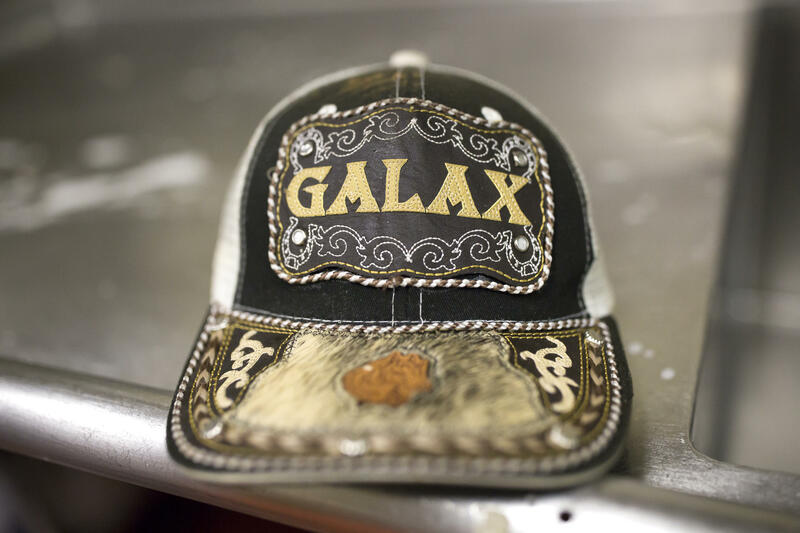 Those factory jobs drew Hispanic immigrants to Galax starting in the 1990s, and even though many of the factories are now gone, the Hispanic population continues to grow. At Barr's Fiddle Shop on Main Street, a Galax institution, owner Tom Barr, 76, says he understands why people come: "I've been to Central America, and I've seen poverty," he says. "I don't blame them for trying to get here." Barr voted for Hillary Clinton in the last election. His son Stevie, 42, is a Trump voter, and says he admires the Hispanic population's work ethic. "There's not a lot of folks around this area that I know of that will go and do what these Mexicans do. They work from daylight 'til dawn." But, he says, the workers should come legally. "If you come properly, it's not an invasion," Barr says. "I think it's a great thing. And if you're not going to come here and work and pay taxes and be part of what we believe in ... It's just the same way with the Muslims and other people. If you come here and you want to change all of our values, then you need go back home." Mike Stevens, 61, a furniture company executive, has stopped by the fiddle shop, and joins the conversation. Like Barr, he's a Trump voter. He supports building the wall at the Mexican border. As for who should get priority as immigrants? "Folks that need asylum," Stevens says, "that truly need asylum. And folks that can benefit this country and not take advantage of the country." But, Stevens says, he believes that some asylum-seekers aren't legitimate; they're gaming the system. In the NPR/Ipsos poll, nearly 40 percent of those surveyed say that refugees and asylum seekers are taking unfair advantage of the system. Among Republicans, that number jumps to 65 percent. For Stevens, assimilation is key. "I think folks need to come into this country and decide that they're gonna have the American values that we've had for 250 years, and say 'I'm an American. I'm no longer from [Mexico],' or wherever they come from — Honduras." "Y'know, these two guys," Stevens continues, gesturing to the Barrs, "We're Americans! We're not hyphenated Americans. I'm not a Polish-American, although I'm 50 percent Polish. I'm an American! So people should take the values of America, they should learn the language, and they should just say 'I'm an American.'" Our poll shows Americans are evenly divided on whether immigrants do not easily assimilate into U.S. society. 33 percent agree that they do not; 31 percent disagree; 35 percent neither agree nor disagree or don't know. Still, Stevens believes those already in the U.S. should get a pathway to citizenship, to "come out from the shadows," as he puts it: especially the DACA kids — the so-called "Dreamers" — brought here as children. On that, Stevens' views are in line with much of the country: 60 percent of those surveyed support giving legal status to DACA recipients. Galax resident Fabiola Escamilla is one of those DACA recipients. She was 13 when she came from Mexico without papers. 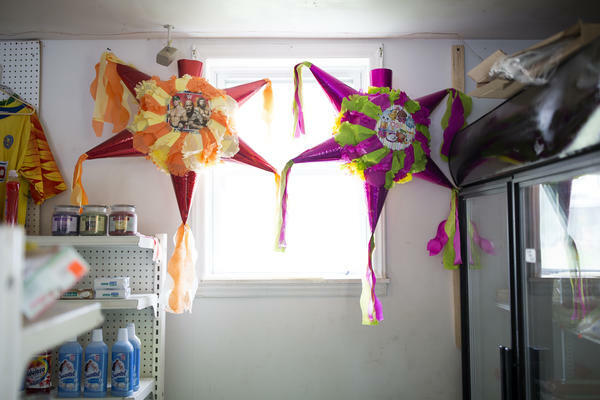 Now 31, she has two sons, both born in the U.S., and she owns a small grocery store in Galax — a tienda — selling tortillas and salsa and arranging transfers for customers sending money back home. After living for 18 years in this country, does Escamilla feel American? "No," she replies. "Mexican. 100 percent. I live in the United States, but I'm Mexican." As for her DACA status, she worries it will be snatched away. "If Trump says you have to go, they kick you out," she says. "It doesn't matter if you have DACA or not. I get really mad and really sad in thinking about the future." Escamilla believes the climate in Galax has gotten more hostile since Trump was elected, and as evidence, she mentions a troubling incident from last year. She was sitting outside her shop with her mother and some friends when a red truck drove by with an elderly white couple inside. "And they scream at us, 'You immigrants, Mexicans, go back to Mexico! I'm gonna call the police!'" she recalls. Disturbing as that encounter was, Escamilla didn't worry that the police would take any action against her. "The police, they know me," she says. "They come and buy drinks." The chief of the Galax police department, Rick Clark, 63, has lived in this community all his life. In Galax, he says, "we're open and accepting. Work hard, pay your bills, take care of your kids, mind your own business — we're good with that." As the Hispanic population of Galax has grown, Clark has added two Hispanic officers to his police force of 24 to help build trust with the Latino community. "It's very important that we be able to communicate with everyone here," he says. "It bothered me that parents would bring their 12 year old who was going to school here to translate and we couldn't understand what they were saying." Clark is troubled by the rise of anti-immigrant rhetoric around the country, and points out that in Galax, the growing Hispanic population is not linked to an increase in crime. "I don't recall the last time — and I look every day — the last time we arrested someone for a property crime or a drug crime that was of Hispanic origin," he says. Clark supports giving undocumented immigrants legal status, even though, he admits, that's not necessarily a popular opinion here. And he believes Americans do have a moral obligation to take in those fleeing persecution or violence at home. "I think that's what America stands for and it's why we were founded," he says. "You know there's a phrase at the base of the Statue of Liberty: 'Give me your poor, your tired ...' I think we may have forgotten that." In our NPR-Ipsos poll, 46 percent of those surveyed agree that America has a moral obligation to accept refugees facing persecution; 26 percent disagree; and 28 percent said they neither agree nor disagree, or don't know. Our last stop in Galax is at a small Baptist church: Primera Iglesia Bautista. As the Hispanic congregation grew at the mother church, First Baptist, it also outgrew its space. So about four years ago, the Latino congregation moved to its own building for Spanish-language services. Ricky Alvarado helped start this church with his father, a pastor. 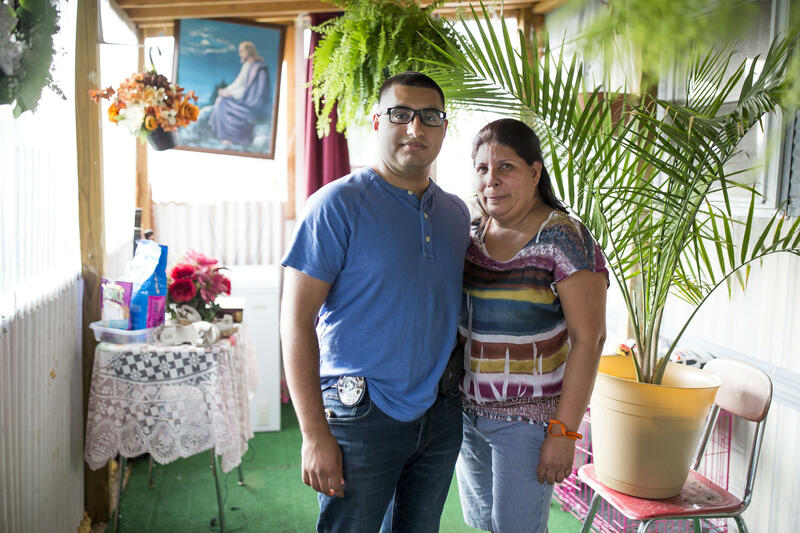 Their family immigrated to the U.S. legally — "the correct way," he says — from Costa Rica. "I might be an oddball," Alvarado tells me. As a Latino Trump supporter, he agrees with the Trump administration's zero-tolerance policy. "You know the word itself says it: it's illegal," he says. "You can't really go into someone's house or a country without permission. A lot of us did struggle a lot to become citizens of this country. And it's not fair if you come into this country illegally — come in through the window, I guess you could say, not the front door." 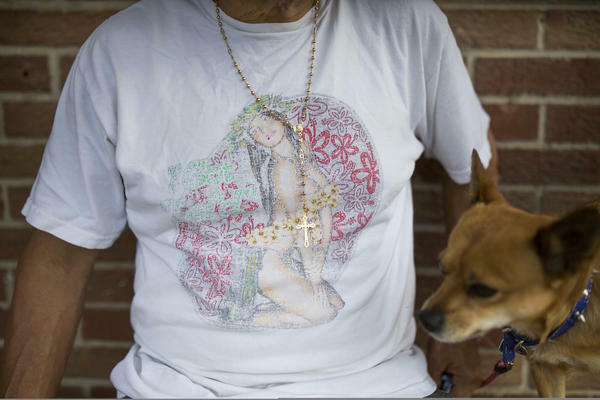 At the same time, Alvarado knows that many in his congregation are undocumented. "A lot of 'em actually came to this congregation a few days after they crossed the border," he says. "There's desperation and there's a lot of a heavy background that they're running away from." So that puts Alvarado in a tough spot. "This has become my family," he says. "I would do anything I could to protect them." Like many in Galax, Alvarado has come to realize the immigration system in this country defies a simple fix.